a part of the amazing story of the revolution in Boston. A Rich Velvet Coat suitable for Boston’s wealthiest merchant and Massachusetts’ First Governor. Photo by Pearson + Killian Photography. "The Bloody Massacre perpetrated in King Street, Boston, March 5, 1770, by a party of the 29th Regiment"
The Bostonian Society's collection includes thousands of artifacts focused on the American Revolution in Boston. In addition to our museum collections, the Bostonian Society Library and Archives has a wide selection of historical documents, including manuscript collections, financial records, broadsides, maps and plans, and newspapers. To find out more, search our entire collection or visit us to see these materials in person. The greatest treasure you will find is the Old State House itself. Lovingly preserved, the Old State House has been at the center of Boston's history for the past 300 years. The 'floating' spiral staircase and special architectural details located throughout this National Historic Landmark are unique to the building. and the stories of Bostonians who lived during the Revolution. The Council Chamber in Boston's Town House (now the Old State House), where the Royal Governor of Massachusetts met with members of his Council, was once a nerve center for the British empire in North America. Now, for the first time in 250 years, visitors to the Old State House can see this historic room as it appeared during the 1760s, when the fate of the British empire turned on the decisions made within its walls. Sit in the Royal Governor's chair, thumb through reproduction documents on display at the Council table, and investigate the tea service, where wares once sold by obscure Bostonians are on display. In this playful, hands-on setting, visitors will discover the surprising story of Boston before the American Revolution, a time when most colonists took fierce pride in their "English liberties," followed the latest London fashions, and sought advancement by cultivating the favor of the royal court. We invite you to enter the Council Chamber and explore how culture, commerce, and ideas combined to define a distinctly "British" Boston just prior to the American Revolution. The Bostonian Society wishes to thank the National Park Service for its generous support of this project. The Society also thanks its partner, the North Bennet Street School, whose talented faculty and alumni crafted the furniture on display in the Council Chamber. Meet Otis, the Old State House mouse. The Bostonian Society would like to thank The William E. Schrafft and Bertha E. Schrafft Charitable Trust and the Massachusetts Foundation for the Humanities for their generous financial support, which helped make this exhibition possible. 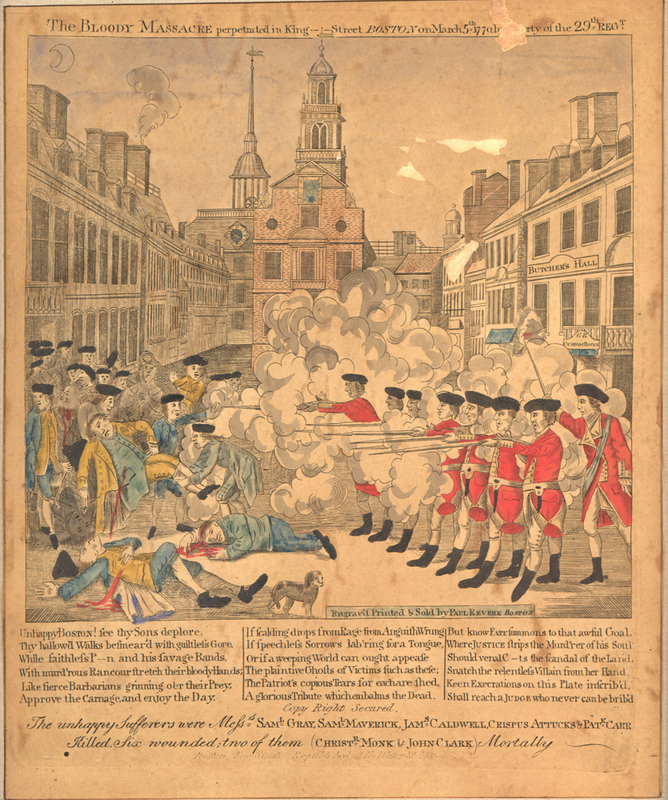 The Bloody Massacre perpetrated in King Street, Boston, March 5, 1770, by a party of the 29th Regiment, after Henry Pelham, Paul Revere, printmaker. Bostonian Society Collections. The Boston Massacre was a seminal event in American history, but few Americans are familiar with the facts about this bloody confrontation. Paul Revere's print of the event is used in countless textbooks on the subject, but Revere's depiction and the term "Massacre" were actually calculated pieces of political propaganda, designed to rouse antagonism toward the Crown. Only five people were killed in the Massacre. This sound and light presentation transports you back to the cold, snowy evening of March 5, 1770, when Boston was occupied by British soldiers. Hear a young apprentice taunting a sentry, and through spotlighted artifacts, images, and ghostly shadows, learn how this insignificant exchange between resident and soldier escalated into a deadly riot. This exhibition interprets the role of Boston, and in particular the role of the Old State House, in the events leading up to the American Revolution. Whether you are a longtime Boston resident wanting to understand your city better or an out-of-town tourist walking the Freedom Trail, this exhibition will help you master the basics of Boston’s revolutionary story. The exhibition uses 150 images and artifacts to trace the changing relationship of the colonial citizens to the crown, the break with England, and the establishment of a new state. Highlights of the room include a coat belonging to John Hancock, tea from the Boston Tea Party, and Paul Revere's engraving of the Boston Massacre. This exhibition explores the lives of our Revolutionary Characters, using artifacts from the Society's collections, highlighting the daily lives, relationships, and aspirations of colonial subjects as they navigated a city forever changed by the conflict with Britain. Visitors will view notable items made by the likes of Paul Revere and Lydia Hutchinson and rare documents from the Society's archives. How do you take care of a 300-year-old building? This exhibition chronicles the architectural alterations that have been made to the Old State House over time, and illustrates the restoration efforts and preservation processes used since 1881 to ensure that it continues to inspire future generations. The year 2013 marked the 250th anniversary of the 1763 Paris treaty ending the 'French and Indian' or Seven Years War in North America. This enhanced digital version of 1763: A Revolutionary Peace - an exclusive Old State House special exhibition marking the Paris treaty 250th anniversary - explores how the events in 1763 remade the map of the continent with profound historical repercussions for North America and the world.